On Oct. 10, Hurricane Michael made landfall in Florida’s panhandle and caused extensive damage. According to multiple news outlets such as CNN, this hurricane has been declared as the most powerful hurricane to hit the continental U.S. in over 50 years. The arrival of Hurricane Michael caused disorder in Florida’s panhandle, since it rapidly developed from a tropical storm into a category 4 hurricane. Yet, no one expected the destruction to be this catastrophic. Mr. Brunson, a resident of Florida, stated in “Far from shattered coast, Michael Packed an Unexpected Punch” an article for The New York Times, how no one affected by the hurricane expected for the destruction of Michael to be so severe. CBS has reported that more than 900,000 homes and business in Florida, Alabama, Georgia and the Carolinas are without power. The destruction caused by Hurricane Michael was so devastating that there are places residents cannot return to. In Bay County, Florida, federal officials have been clearing out debris and other damage caused by the storm to allow residents to return. “It’s still not safe to return, particularly to Bay County, Florida,” stated Bronck Long, head of the Federal Emergency Management Agency to USA Today. 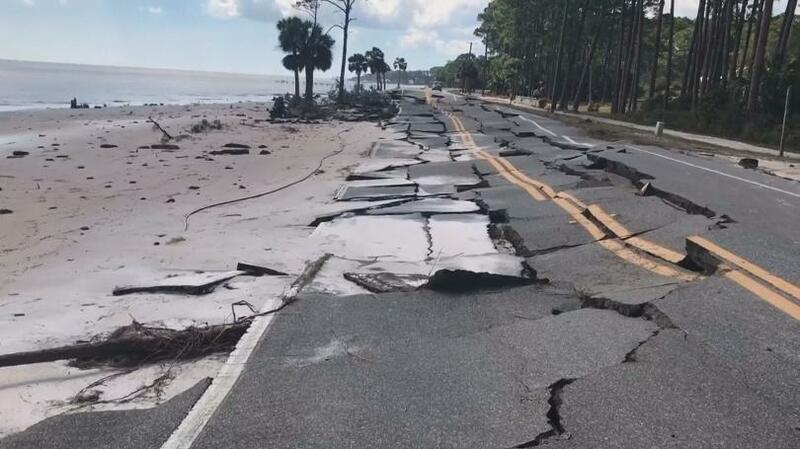 “There is no infrastructure there to support you and quite honestly it’s a dangerous area to go back into.” He also mentioned that anybody who evacuated Mexico Beach would have to wait a long time before returning as well, since Mexico Beach is one of the most damaged areas. Governor Rick Scott stated after having visited Mexico Beach to Fox that the area resembles a war zone in which a bomb went off. News outlets, such as Miami Herald, that thousands of people have been reported missing to local authorities, Red Cross and the state. The nationwide death toll has risen over 25, according to CNN. Seminole County Emergency Management Director, Alan Harris told the state Emergency Operations Center during its briefing that so far, the state was avoiding setting up a temporary mortuary. Long expects the death toll to rise. Additionally, emergency officials have told Fox News Network that they had completed an initial search of the devastation, looking for the victims, and have begun a more careful inspection of the ruined infrastructure. USA TODAY reported that places such as Bay County have received scarce news from their school district on whether the schools will be back up and running. They have been advised to find a temporary solution for their children if their schools were destroyed or severely damaged. Long lines have already started to form outside fire stations, schools and Salvation Army food trucks as residents try to find food and shelter. Gov. Scott tweeted on Saturday that millions of meals and gallons of water are already on the way to assist the impacted communities. Although hospitals have had to turn people away due to overcapacity, measures are still being taken to help those in need. Bay Medical Sacred Heart in Panama City was boarded up and did not have any water available. Despite this, CNN reports that there were handmade signs to direct patients to emergency rooms, which remained operational. Alex Azar, U.S. Secretary of Health and Human Services, declared an emergency in Georgia on Thursday which was followed by Florida to make payments more flexible to Medicare and Medicaid beneficiaries, providers and suppliers. Relief services have already started helping the families who lost everything because of Hurricane Michael. Funding sites, donating blood, animal services and housing services are all essential components of the relief efforts. AirBnb is looking for homeowners in the areas affected by the hurricane including parts of Florida, Georgia, South Carolina, North Carolina, Virginia and Alabama to provide housing for relief workers and people who have been displaced. “I think it’s great that there are relief efforts, because the panhandle residents are homeless right now and will be needing food, water, and supplies,” Monika Brill, sophomore marketing major, said. Devine added that there is an UT event planned by Monnie Wertz, the assistant vice president for operations and planning, where colleges and universities share information. In addition, they also participate in trainings and briefings that are offered throughout the year, both locally and at national meetings. Campus Safety and many others who are involved in some aspect of emergency response (communication, shelter, transportation, medical/wellness, food provision) are included. “I feel bad for the people who do not have power, communication, and a home to return to and I hope they have friends and family to help them out,” Brill said.